Often, for most fashion designers, the challenge is not necessarily the fashion production process of turning raw materials into finished fashion products for public consumption, although that poses its own problems. The bigger challenge is the marketing and merchandising that helps designers make returns on their investments. Indeed it has been the difference maker in separating successful designers from the not so successful ones. Specific to Africa’s fashion industry and its many design professionals, over the years, we have begun to see a few names make major strides towards laying the blue print of what it takes to get your product in front of your target audience so they can purchase your goods. One name, Jewel by Lisa (JBL) (Nigerian fashion designer), stands out. The JBL label has made consistent and huge strides in gaining visibility across Africa and internationally, thereby helping to increase the brand equity and fan base of JBL. Specifically, one of the marketing methods we have seen JBL employ is to have Nigerian and American celebrities rock the brand’s designs on highly visible red carpet events. Examples of American names that have rocked the JBL label include: Catt Sadler, Lala Vasquez, Angela Simmons, June Ambrose, Kelis, Dawn Richard, Solange Knowles and of late Thandie Newton. My interview with Susan Ashbrook, the pioneer of Red Carpet Marketing/Product Placement and Author of ‘Will Work for Shoes, The Business Behind Red Carpet Product Placement,’ in behalf of Ladybrille Magazine, answers the above question and more. Ashbrook’s interview also gives designers insights on how to filter through and select publicists that are actually connected to industry insiders/celebrities and can help designers get their product placed with these celebrities. Ashbrook has been involved in celebrity product placement for twenty years. She founded and pioneered Film Fashion, the first fashion product placement company in Los Angeles. Her first client was Ralph Lauren, and she went on to match top celebrities with a roster of clients that included Lanvin, Chopard, Swarovski, Escada, Isaac Mizrahi, and many more. She has also consulted for non-fashion brands like Nikon, Hasbro, and MasterCard. In 2008, Ashbrook sold Film Fashion to the Public Relations power house Rogers & Cowan. 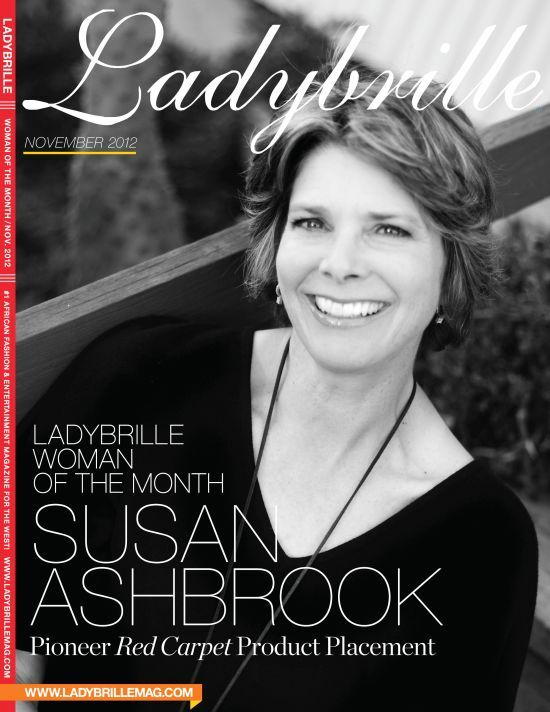 NOTE: Ashbrook’s interview was scheduled for publishing on Ladybrille on Veterans day, November 12th, 2012. Unfortunately, we were unable to publish it at that time. We apologize for any inconvenience it may have caused our readers. Enjoy the interview. LADYBRILLEmag.com: Hi Susan, how are you?! Susan Ashbrook: Very well, thank you so much. LADYBRILLEmag.com: I am so delighted to have you as our Ladybrille Woman of the Month for November 2012. For people who may not know you, could you give us a short synopsis about your background? Susan Ashbrook: Yeah. Sure. I started working some time ago as in house Director of PR for a designer named Richard Tyler. He was based in Los Angeles and had a store, and he was a designer for Anne Klein. He wanted some publicity and I would call fashion editors (in his behalf) but they didn’t seem to know who he was. When I mentioned that he was dressing Julia Roberts and Mick Jagger, they became interested in him. So, that started me in thinking about working with celebrities in fashion and how powerful they can be. So, that’s basically what I have been doing. I have been doing product placement and I work exclusively with fashion and celebrities. LADYBRILLEmag.com: Let’s talk about working with fashion and celebrities and specifically zoom in on product placement. When did it become clear to you that you wanted to take the whole product placement on to the red carpet? Susan Ashbrook: I began thinking about how I could really help designers gain the attention by using the power of celebrities along with fashion. When I started my business (Fashion Film Company) many years ago, I noticed that when celebrities where photographed on the red carpet, that the reporters were asking what they were wearing and they were commenting on what they were wearing. At that time, celebrities were actually buying their clothes and I realized (then that) it would become a big business, which it really has. Now it is an extremely big business. What celebrities wear can really skyrocket a brand. For instance the first time Uma Thurman went to the Academy Awards, a dear friend of mine (w)ho was a costume designer at the time, was enlisted by Prada to help dress Uma Thurman. So, Barbara (Ashbrook’s friend), Prada and Uma Thurman worked on this beautiful lavender very simple A-line dress. Well no one really knew about Prada back then. But when Uma Thurman walked on that red carpet, they knew about Prada very quickly. She made that brand very visible. So, I just recognized that early on and I focused on fashion clients and I have been successful ever soon. LADYBRILLEmag.com: You have a very similar story to the Uma Thurman one that you discuss in your book ‘Will Work for Shoes’ and also in your speaking engagements. Can you share that story with our audience? They were willing to make the perfect gown for Kim. The only problem was that she could not decide what color she wanted, what the silhouette will be, the designer was sending her sketches everyday. One day it was a blue gown, the next day it was a purple gown. So the designer said to me, “listen, I am all the way in Germany. I am going to send you my very best couture seamstress to do whatever you can.” So this seamstress came, I set her up in a hotel and ultimately offered informed Ashbrook that he would send his best seamstress to the States to help make Bassinger’s dream dress to the Oscar a reality. The seamstress arrived in the USA, Ashbrook set her up in a hotel and everyday, they met with Bassinger and her stylist and a few weeks before the Oscars, Bassinger decided the gown should be a green gown. Ashbrook and her Escada seamstress traveled to downtown Los Angeles, bought the fabric and she began to make the pattern, sewing and fitting the gown. LADYBRILLEmag.com: (Laughs) (What a story!) The success looks great but what about the stories where it does not work out? Susan Ashbrook: Kim was a great success. But there was another story where Geena Davis was going to be attending the Oscars. She had seen a painting of a beautiful woman wearing a simple strapless gown. She liked the idea of that gown but she wanted it to be a different color. Escada had had success with Basinger so they thought “no problem we can design this gown.” So, they sketched a gown for her and a day before the Oscars, she tried on the gown and it was too small. Susan Ashbrook: Yeah and you know if a gown is too big, you can easily alter it down but if it is too small, you cannot make any changes. I ran around their stores and showed her different gowns but of course she had her heart set on that gown so it was not going to work. I don’t recall what gown she ended up wearing but it wasn’t an Escada gown. That happens a lot. Whenever designers do custom gowns or show celebrities sketches, celebrities are not in the fashion business. They see beautiful sketches and pictures and they like the look but when it comes to actually putting the dress on, a lot of times it doesn’t work because they do not have that kind of vision. They try it on and they say, “well this isn’t what I had at all in mind.” You never know until that celebrity actually attends the event whether it is going to work, and quite often, celebrities have many dresses as backup. A stylist will have to go out and get jewelry, shoes and handbags for not one dress, but five dresses because it can be dictated by (many factors). If it is sunny, I will wear this dress, if it is raining I will wear this dress, if it is cold, I will wear this dress. So, if you are a designer in that business, you really don’t know till they show up what is going to work. LADYBRILLEmag.com: What were some of the (challenges) of running your company? Susan Ashbrook: When I first started and would go around explaining to fashion companies my concept about getting their clothing and jewelry on celebrities, they would say, “That is a great idea but wait, we have to pay you?” And they would say things like, “why don’t we just pay you when it works. Why do we have to give you a monthly retainer?” The truth is I didn’t set my business up in that way because you know you are still out there trying and pitching and that is hours of your time and you should be compensated for that. Susan Ashbrook: A lot of times I tell students, (for example), yes intern but the fact is at some point, you have to decide that you have paid your dues and now it is time to get paid, it is business. Working with celebrities certainly has its ups and downs but it is a business. The clients I represented for many years benefited greatly. I had celebrities wear their products and in turn, magazines would write, “Kate Hudson wore blah, blah, blah.” Well that was free advertising. Had they paid for that mention in People Magazine, it would have been hundreds of thousands of dollars. So, my little monthly retainer was nothing and I really felt strongly that I should be paid for it. LADYBRILLEmag.com: What did you enjoy most about running Film Fashion, your Red Carpet Celebrity Marketing company? Susan Ashbrook: The high was that everyday was a new day. I never knew what celebrity I would be working with, what was going to be a big hit or not. I loved that! And that was one of the reasons I got into fashion in general because fashion is all about change and new things. Everyday I was going to work. I did not have a structure. You know today I may go into the office at 9, work till 10, take time to visit a celebrity on set, it was very exciting that way and I loved that! LADYBRILLEmag.com: (In a shocked tone) Oh my God, seriously. Susan Ashbrook: (Laughs) I got in my car and fortunately the gown was there, nobody stole it but it was kind of scary at times being responsible for that. Of course jewelry too. I represented Harry Winston (Jeweler to the Stars) and Chopard. In the very beginning, you would deliver a jewelry and a celebrity would pick it up but later when they were borrowing jewelry that were worth millions and millions of dollars and the value was so incredible, of course that is when body guards came in. LADYBRILLEmag.com: Hmmm . . .
Susan Ashbrook: They would have to go with the celebrities to these events to protect the jewelry. So, fun, yes, but also a huge responsibility. LADYBRILLEmag.com:Let me transition to why you decided to get out of (i.e. sell) the business. I mean you had such successful career, a fabulous location from what I remember in past visiting your office. It just seemed like you had the perfect glamorous, amazing life. Why did you get out and why at that time? Susan Ashbrook: Well, that is a great question. I was fortunate to sell my company to a large PR firm. I sold my company to Rogers and Cowan and they had a lot of divisions. They had a division that represented corporate clients, they had a sports division, they had a division that represented movies and major stars but they didn’t have a fashion division. So, they believed that if they bought some fashion, they would have a fashion division. So, that was a good time to sell my business. It was a good time for me. I said earlier in the interview that I really love change. Well I felt that I had grown the fashion business as far as I could. I opened an office in New York, I sold the business to Rogers and Cowan. You know I felt like I had done this for twenty some years and I was ready to try something new. I did not know what that would be but I felt it was time to try something different. LADYBRLLEmag.com: Well one of the things you tried (that was) different was to write a book. Your first book I presume is the book “Will Work for Shoes, The Business Behind Red Carpet Product Placement.” (Great read and highly recommended to every Ladybrille reader in the fashion business especially designers, publicists and stylists). When did you get the epiphany that you should write this book and why the title ‘Will Work for Shoes’? Susan Ashbrook: Well when I was working and would travel on the plane and be flying over the Midwest, you know I’d be sitting next to someone randomly and they would comment, “what do you do.” I would say, “you know I represent fashion houses and I put their clothing and accessories on celebrities.” People always seemed so shocked by that! Susan Ashbrook: (Chuckles) They would say, “Oh my gosh! I never knew.” You know they never knew there was a business behind all that glamour. So, I always carried that thought with me. People would also say to me, “I have a t-shirt, a shoe handbag, how do you get your product to a celebrity and can anyone do it?”And so, when I sold my company and decided to sit down and write, I decided that there really wasn’t a book, when I researched it; that would help people get their products to celebrities, that will actually go through the steps and the tips. One of my clients was a handbag designer named Mary Norton. Mary Norton actually started in the living room of home. Her husband was sick and he couldn’t work. So she said, “Oh my Gosh! What can I do to help bring money and put food on the table?” So she started these lovely, lovely handbags. Her business grew and she eventually came to hire me. We got her handbags on celebrities and she had a success story on her own. But, I just thought there were people like Mary that were designing things on their own and wanted to get their product to celebrities. How could they do it? So, that is how my book got started. The idea for the (name) ‘Will Work for Shoes’ actually came about because one time I was working with a Chinese Actress that was attending the Oscars. I remember that I had to meet her at 2 O’clock in the morning when her flight got in. So, there I was in the hotel lobby at 2 in the morning and there were other designers and I thought, “Oh my God are you kidding me?! Here I am working for shoes.” (Laughs) And that’s sort of how the title came about. LADYBRILLEmag.com: (Laughs) Oh,that is such a neat little story. How do Ladybrille African Fashion Designers Get Their Products on Celebrities? LADYBRILLEmag.com: (L)adybrille Magazine really focuses on bridging the gap between Africa and the West through fashion. Within Africa’s fashion industry, (how would you suggest) professionals with luxury brands on par with designers like Marc Jacobs etc. . . (for example) designers like David Tlale (South Africa), Tiffany Amber (Nigeria) etc. get their designs on the bodies of A-list celebrities? Susan Ashbrook: I think that is a wonderful question. One of the things that I talk about in my book is that celebrities, and I have worked with over 7,000 celebrities, are real people. They truly are. Imagine if you received a book with pictures of beautifully drafted images, wouldn’t you respond? That is one of the tips I give. First of all, I talk about the importance of putting a target list together. I know for every designer, they usually go for all the biggest stars. Who wouldn’t? You want Charlize Theron, Halle Berry. Sure they should be on your list but I also talk about being realistic with your list. Put the big stars on there but also put some smaller stars on there that are just starting out in their careers. Take a little time to research it. It could even be sport athletes from your country, people that have some visibility. That is one of the things I suggest. Then the second thing I suggest is that once you have your target list, you want to try to put their contacts together. How do you get to them? Primarily it will be through their Publicists. I provide tips on how to find their publicists. (S)end them a booklet, a power point presentation of (your ) pictures. Start there. You want to describe yourself. You want to describe, very briefly, on one page, who you are, why you are contacting them, your story, what your clothing is made out of, your jewelry, your designs, the idea behind your designs. The celebrity reading and seeing your pictures should understand who you are and who your brand is. I think that is a great way to start and if they see something they like, they will get in touch with you. LADYBRILLEmag.com: (You have shared such insights). Let me wrap this interview up with some philosophical principles you live by. I have found that some of the most successful (people) in business have a set of guiding principles they follow. What are the daily principles you live by? Susan Ashbrook: I mentioned to you that celebrities are real people earlier. That is one thing I carry with me. I don’t act any different when I am with them, and I don’t act any different when I am with designers. I have worked with some very famous designers and I continue to. I respect them but I require that they respect me too. LADYBRILLEmag.com: Absolutely. I love that. Respect is at the center of it all, regardless of who it is. Susan Ashbrook: It’s a very funny story. When I was a young woman, I heard an interview with Marilyn Monroe where a reporter asked her what she wore to bed at night. She said she wore Chanel, Chanel perfume, and I always remembered that. So, I saved my money to buy that Chanel perfume. Of course when I bought it, it was much too strong for a young girl. So, celebrities influence me and continue to influence me. They influence a lot of people. That is what got me into this business, I was able to recognize that and I created a business around it. LADYBRILLEmag.com: What do you think it is about celebrities that influences you in such manner? Susan Ashbrook: You know, I, I wish I could answer that question. (Pauses) Because they are in the public eye and hopefully they influence me and influence others in a positive manner. Those are the celebrities I gravitate to, the ones that have lived their lives in a positive manner. LADYBRILLEmag.com: When all is said and done, what does Susan Ashbrook want to be remembered for? Susan Ashbrook: I am very proud of the fact that I pioneered a business that nobody else was doing. I am very proud that I was able to create something new, a new idea. LADYBRILLEmag.com: What is the best piece of advice you have ever received? Susan Ashbrook: I can’t think of one specifically. But I do recall working with the designer Richard Tyler when I first started. He would have people constantly asking for fashion advice and he would say the best piece of advice he could give was to always have a full length mirror. I think that is true in many ways. Not only do we look ourselves in the mirror and see the physical but if we look in the mirror, if we are honest with ourselves, hopefully, we like who and what we see, you know what I mean? LADYBRILLEmag.com: Absolutely. Okay! What do you do to relax and reward yourself for all these hardwork? Susan Ashbrook: Well my husband and I actually grow our own grapes and have our own wine. It’s called El Rey Wines. I think it started because I enjoy drinking wine. That is kind of a new fun project for me. Susan Ashbrook: We have a large property, a ranch that we grow our own grapes. LADYBRILLEmag.com: That must be exciting to see it from the beginning to the end, the whole process? Susan Ashbrook: It is a whole lot of fun and we are meeting a whole different set of people. You are meeting people who like growing things and pairing them with food. I enjoy the mix of both. LADYBRILLEmag.com: Yeah and you are one with nature, and you, known to (be on the pulse) of future trends, (are dabbling) in the food industry that is extremely successful. Even with its challenges, there are lots of success stories. Susan Ashbrook: (Laughs) I hope we will be one of those success stories. LADYBRILLEmag.com: Of course. You already have the blue print for success, I am sure you can emulate the success with your new business. Susan Ashbrook: (Laughs) I hope so. LADYBRILLEmag.com: Okay! 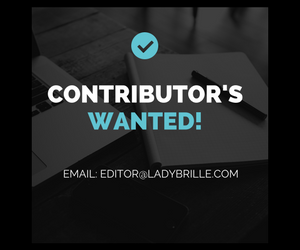 Any last words you want to share with our remarkable community of accomplished brilliant (Ladybrille) women? Actually, first, let me ask you about how you juggle or balance work with personal life? Susan Ashbrook: I think I am continually balancing things and as we talked about earlier (off record), it is the nature of who we all are. We do that: our families, our professions, we balance. One thing I would say is that I have had the privilege of working with many actors and the one thing I learnt from them is that they are a very persistent group of individuals. They are used to being told, “you are too young, you are too old, you are too big, you are too small” but they still remain very persistent. That has been something that has really kept me going, in the very beginning of ,y business. It is not easy to start any business. You are told “no” all the time but be persistent. LADYBRILLEmag.com: Whoa Susan! It has been real. Thank you so much for giving of yourself. Your book totally permeates the US fashion industry and certainly could be used across Europe and Africa’s fashion industries. Many fashion industries around the world could use this. Thank you. LADYBRILLEmag.com: We wish you continued success and keep us abreast of your career moves. Susan Ashbrook: Thank you. I will be watching you and your career. LADYBRILLEmag.com: (Laughs) Definitely, all the way to the top. (Laughs) Thanks for the interview. PLEASE VISIT AMAZON.COM TO PURCHASE SUSAN’S BOOK.